A Connecticut woman has been seriously injured after lighting a stick of dynamite she thought was a candle, police have said. Thunderstorms knocked out power to several homes in the historic town of Bridgeport, Connecticut on Thursday night, leaving residents scrambling for a way to see in the darkness. In the confusion, a 30-year-old woman reportedly grabbed a quarter stick of dynamite she had mistaken for a candle. The woman suffered severe injuries to her face and hand, which may result in the loss of at least one finger. She was transported to a local hospital and she is receiving treatment. Her husband and two children were home at the time of the incident, but no other injuries were reported. Bridgeport police spokesman Al Harris said the family had attempted to go to Home Depot to buy emergency lighting during the blackout, but the store was closed. They remembered that the previous owners had left what appeared to be candlesticks in the basement, and went to light them. The sticks turned out to be explosives. “In a city the size of Bridgeport we see a lot of different incidents, but nothing like this,” Said Mr Harris. The Bridgeport police and fire departments responded shortly after the explosion occurred, around 9:20 pm. They quickly called in the state police, state fire marshal, and state police bomb squad to investigate. At least one other dynamite device was discovered in the house, Mr Harris said. It was taken to a secure location to be detonated. It was unclear why the dynamite was in the house to begin with, but Mr Harris said small sticks are occasionally sold on the black market for use in fireworks. 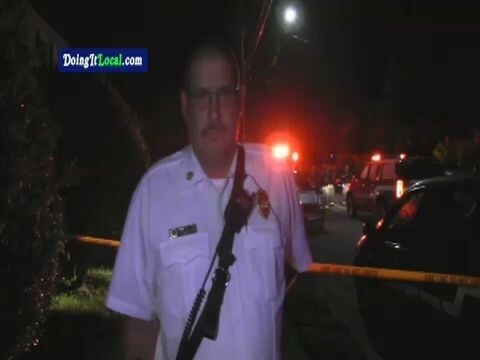 The Bridgeport police said they would not be pressing any charges at this time, as it appears the family was previously unaware of the explosives in their basement. The police department cautioned residents in a statement to immediately contact their local fire department if they found any unknown, possibly explosive objects in their homes. They also reminded families to always keep emergency lighting on hand. “Preferably the lighting should be battery-operated, glow stick, or hand crank lighting so as to avoid the risk of fire damage,” they added.